Today we are interviewing A.R. Hellbender, author of the young adult/fantasy novel "Unicorn Hunting." I’m 26 years old. I started writing when I was a kid but only seriously began putting novels together at age 18. I also play bass in an all-girl band. Describe the plot of your new book, "Unicorn Hunting," in a few sentences. The book takes place in a society where there isn’t much employment for young girls, so the ones who need money become unicorn hunters. The main character, Cal, and her friends encounter a lot of problems along the way, and get to know the real story behind the unicorns and realize that there is more to them than animals to be hunted. I have encountered people of all ages and all reader types who loved Unicorn Hunting and couldn’t put it down. People who like fantasy, unicorns, young adult books or magic are sure to appreciate it. Anyone active in the LGBT community would likely be interested in it as well, as the book contains LGBT themes but doesn’t make it the main focus. Tell us a bit about the protagonist, Cal. Cal is a 15-year-old girl who would not have become a unicorn hunter if her parents had not insisted on it. In some ways, she is a spoiled teenager who takes her family for granted, but in other ways, she is in the right and just has no one around who can empathize with her. Her main motivation throughout the story is her crush on the girl next door, who she can never be with for several reasons. When I began writing this book, all I knew was that the main character needed to have money problems, family problems, relationship problems or all of the above for the story to work well. Depictions of unicorns vary in fiction. Can you describe the unicorns in "Unicorn Hunting"? Though I obviously took some inspiration from the traditional unicorn folklore, these unicorns come with an interesting twist. They came to the world of the story through a portal and have been unable to get back to their world for centuries. They reproduce by cutting each other’s heads off so that the head grows a new body and the body grows a new head. This makes them slightly creepy and contributes to the fact that they are not like horses. Probably every book I have ever read has influenced my writing style in some way, whether I realize it or not. But I am a big fan of Neil Gaiman’s and Raymond Chandler’s writing. The first book I wrote, which may be the next one I publish, went through a lot of major changes and dozens of drafts. Just looking at an old draft of it or a deleted scene is a great measure of how much about my writing has changed. I plan to write more books and never stop, of course. 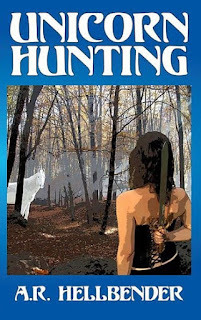 I have a few books in the works, including Unicorn Hunting’s sequel. But the one I am most excited about is the other book I have already completed, about an immortal sorceress who wants to die. That book will be called Her Dark Highness: The Myth, the Magic. I still never get tired of reading it.